One of the best movies ever made about Hollywood. Joe Gillis (William Holden) is a struggling screenwriter. He is completely broke and his car is about to be repossessed. He is trying to avoid the repo men and ends up parking in what he assumes is the garage of a deserted house. 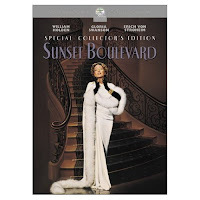 However, he soon realizes that the house is not deserted but is occupied by a former silent film star, Norma Desmond (Gloria Swanson). Soon he and Norma start talking about their circumstances and they decide to work together. Joe will write the screenplay that will bring Norma back to her adoring fans who send her hundreds of fan letters. Eventually their relationship turns romantic and that is when everything begins to go wrong. He meets Betty Schaefer (Nancy Olson), the fiance of one of his good friends. The two begin working on another screenplay and they eventually fall in love. However, Norma is mentally unbalanced and she will not let Joe go without a fight. This movie was incredible. Gloria Swanson is brilliant as the insane movie star. Erich Von Stroheim was terrific as Norma's attentive butler, Max. The cinematography was wonderful and the music was perfect for the movie. Among the people with cameos are Cecil B. DeMille, Buster Keaton and Hedda Hopper. There is a remake of this movie scheduled for release in 2008 starring Glenn Close as Norma Desmond. The remake is a movie version of the Andrew Lloyd Webber musical. However, do not miss the original it is one of the best movies ever made.